The event witnessed huge student participation & industry interaction from all over the country at The Orchid 5-star Ecotel Hotel, Mumbai from Dec 16-18, 2014. The 3-day event comprised of intense, interactive workshops, seminars, in-flight training, personal grooming sessions & an award ceremony, providing a unique learning opportunity for Aptech students. 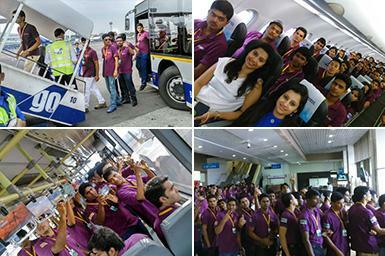 The event took off when our students boarded a chartered flight at the Chhatrapati Shivaji Airport in Mumbai. The students enjoyed the view from the top and received hands-on, field training in understanding the functioning of airports and airlines from the crew of GoAir.